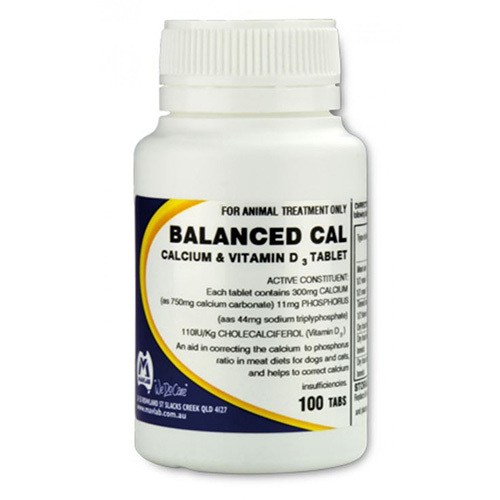 Balanced Cal tablets are an easy to administer scientific formulation that fills up the gaps of a balanced diet. These tablets fulfill the vitamin and mineral deficiencies of cats and dogs. The tablets have chocolate flavor and are taken as a treat by the pet. Suitable for all sizes of cats and dogs, these food supplements benefit the general health of the pet. Balanced cal tablets are made up of calcium, phosphorus and cholecalciferol. The combined effect of the ingredients helps in correcting the calcium phosphorus ratio of in meat and cereal diets of pets. These food supplements are suitable for all breeds of cats and dogs. They aid in general wellbeing and proper growth of the pet. Dosage of the tablet varies with the weight and diet of the pet. Ask your vet about the correct dosage of the tablet. If the pet does not take it directly in the mouth, then crumble it and mix with the pet’s food. Note: It is safe for pregnant and lactating cats and dogs. Firstly, these tablets are suitable for both my dogs and cats. And secondly, they fill up calcium deficiencies. A must have product!